The first sign of aging can be seen from the eyes, so, to protect our eyes should be our first priority. We can keep our eyes healthy and safe by eating good and healthy foods, applying under eye cream before sleeping, and protecting eyes from harmful sun rays by wearing a good quality sunglass from the best wholesale sunglass store or a retail store. To have a good night sleep is also very necessary. You should sleep for at least 8 hours a day. 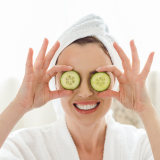 Tension and anxiety are the most dangerous factors for dark circles. So, that should be avoided. These factors help a lot to maintain the beauty of our eyes.